The evolution of pizza ovens has made them ideal for cooking foods in addition to more than just their namesakes! Fortunately, all pizza ovens are not created equal, and different types are designed for different outputs, space constraints, and different products altogether. Made from refractory or high heat bricks, these ovens utilize a hearth and dome modeled after the styles of ancient bakery ovens. These can be fueled by wood, gas, or coal but pizza lovers generally agree that wood is the best source when you’re opting for a true, authentic taste. Some models come primarily fueled by gas but with some wood burning to add to the flavor and smell as well as a more traditional look. 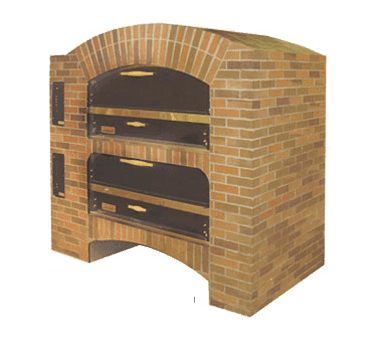 Brick pizza ovens are generally a favorite for any authentic-style pizzeria due to their aesthetics and wood-fired taste. Temperature: the range for these ovens will typically fall between 700 and 1000 degrees on the hearth. Times: preheating can take upwards of an hour since you’re utilizing slower-burning sources (unless you opt for gas-powered, of course). Once heated, though, pizzas can be cooked anywhere from 90 seconds to five minutes depending on how many you’re cooking at once. Heat recovery should only last a few minutes before your next pizza is ready to be baked. Deck ovens utilize a metal, stone, brick, or ceramic tile deck within an oven where an uncooked pizza is placed and heat is then transferred from the deck to the pizza. This allows for both crust and toppings to heat at the same time. Some gas deck ovens can be purchased to look like an old style wood oven which is a great customer focus and can make a quality statement. These are available in both floor model and countertop models. Temperature: stone decks should be between 400 and 700 degrees for proper cooking. Times: save an hour of time for preheating, but once heated, a deck oven at 500 degrees will thoroughly cook product in 6-8 minutes depending on thickness and toppings. There are also P22 electric countertop deck ovens that are ideal for warming up slices of pizza. Bake time is 5-7 minutes up to a 16” pie, but these ovens are mostly used for heating up slices or personal pies. This oven is faster than a conveyor oven. Operate like a real deck oven by cooking directly on the stone, spinning the pies throughout the process for even baking. This model is good for cooking other products like calzones, cookies, dough knots, etc too. If you have a lot of employee turnover and you are looking for a very consistent easy to make a product, a conveyor oven would be better. It’s slower, but you will get the same back every time. This oven decreases time and utilities compared to the previous two counterparts, making it an affordable option for restaurants or establishments that don’t solely focus on pizza production. Countertop ovens like these will limit pizza size. Temperature: cooking at a low 460 degrees, these ovens help to conserve energy costs. Times: cutting down drastically on preheating, these ovens can preheat in 15 minutes or less! Similarly, cooking times for a single pizza or full capacity of pizzas will only take around 5-6 minutes. The choice between conveyor and deck oven depends on your restaurant, your needs, and what you’re willing to compromise. Conveyor ovens get their name because of the conveyor belt that is used to transport products through the oven. The product is then transported to a resting place outside of the oven at a preset speed, allowing for little to no supervision during a majority of the process. There are many sizes available from single countertop units to triple-stacked full-size decks! Temperature: ideal cooking temperature within a conveyor oven is between 400 and 600 degrees. Times: because there are no decks or hearths to heat, there&rsquo;s virtually no preheat time. 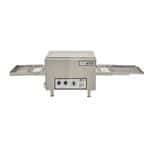 Conveyor cooking also takes 4-5 minutes for a pizza when the temperature is around 500 degrees. Your restaurant may already have a convection oven for other cooking purposes, making it a versatile piece of equipment if you aren’t a specialty restaurant. You can even opt for countertop models to take up less space in your kitchen. If you’re a pizzeria, this oven shouldn’t be an option for your pizza cooking needs. 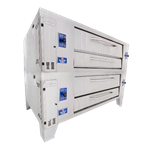 These ovens are best for restaurants with low volume outputs, as you’ll generally only be able to fit 2-5 racks per chamber which can fit one or two 16" pizzas on each rack. Convective heat may cook the outside too quickly and affects the pizza differently than a conductive heat oven. Trial and error is in order. Also, if you are buying a convection oven and plan to bake, look for a higher end unit that distributes heat evenly. Temperature: keep in mind that convection ovens reduce cooking temperatures by around 25% depending on the model due to the circulation of heat within the cavity (which, thus, speeds up cooking times too). Times: one pizza will usually take around 5-6 minutes to fully cook, but time will vary depending on the temperature and the number of pizzas in the oven. These pizzas are round and have a thin, crispy crust, allowing the user to fold slices in half for easier handling. Toppings include mozzarella cheese, tomato sauce, and a variety of choice veggies or meats. Best oven: brick oven, deck oven, conveyor oven, convection ovens may scorch the crust. These deep dish pizzas have a thick crust and are baked in a pan with at least a 1&rdquo; depth. After the plain crust is crispy, it’s generally loaded with toppings and placed back into the cavity to finish cooking. Best oven: pizza deck oven and brick oven. Similar to New York style pizzas, Neapolitan pizzas have a slightly thicker crust. Toppings can vary, and to be considered a true Neapolitan pizza, strict rules on ingredients and preparation need to be followed. Best oven: all ovens can easily bake this style of pizza. These pizzas set themselves apart due to their square or rectangular shape. They also boast a medium to thick crust with traditional toppings including anchovies, pecorino cheese, and garlic. Best for pizza deck oven and brick oven. Because many pizza ovens are designed for only cooking pizzas or similar foods, there are many specialty pieces of equipment that can improve the use and function of your pizza oven. Pizza Oven Brush and Scraper: Cleaning the cavity of your pizza oven can be difficult, especially if you’re working with large conveyor, deck, or brick ovens. A brush/scraper is designed with a long handle for easier cleaning. 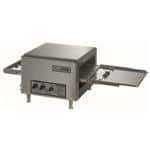 Pizza Warmer: For convenience stores with grab-n-go items, pizza warmers allow staff to box up pizza by the slice for portability. Just remember to keep your boxes in a pizza warmer to ensure food safe temperatures are maintained and to improve customer satisfaction. Pizza Peel: These large, flattened accessories are essential for brick ovens where pizzas need to be rotated within the cavity, but they’re also ideal for simply moving pizzas from one place to another. Pizza Screen: Trays can keep pizzas from coming into direct contact with the oven surface while keeping the crust softer during the baking process. Refrigerated Counter/Pizza Prep Table: A refrigerated unit keeps toppings chilled but within easy access for an efficient workline setup.